Halloween is quickly approaching. While college students may not be trick or treating, there are plenty of things to do around campus that will allow you to get into the Halloween spirit. Here is a list of quick, cheap and crowd-pleasing costumes. Sim. Remember the computer game The Sims that was all the rave in the 90’s and 2000’s? Put on any outfit of your choosing and wear a green diamond headband to mimic one of the iconic characters. Emoji. You can either dress like the emoji you are channeling or create a cut out of one using cardboard and construction paper. Lifeguard. Simply pair a red swimsuit with a matching pair of shorts, flip flops and a whistle and you’re good to go! Living doll. Get a cardboard box, write a logo on it and pose! Rosie the Riveter. Wear a denim on denim outfit and tie a red bandana around your hair then strike the infamous pose! Glue Bottle. Recreate or purchase a shirt with the Elmer’s Glue logo and pair it with an orange cone shaped birthday hat. Drink. Dress up as your favorite soda or other beverage. Simply wear a t-shirt with the logo on it and there you have it. Fruits and Veggies. There are several great options online. Witch. Dress in all black and pair it with a witch’s hat than can be found for less than ten dollars! Frida Kahlo. Transform yourself into the art icon Frida Kahlo by donning a flower crown and using makeup to etch in her signature unibrow. Top off the costume with a brightly colored outfit full of rich patterns. Hippie. Take it back to the 70’s with clothes you already own. Pair wide legged pants with any fringed or tie die clothing. Take it to the next level by wearing shaggy hair and earthy accessories. Popcorn. 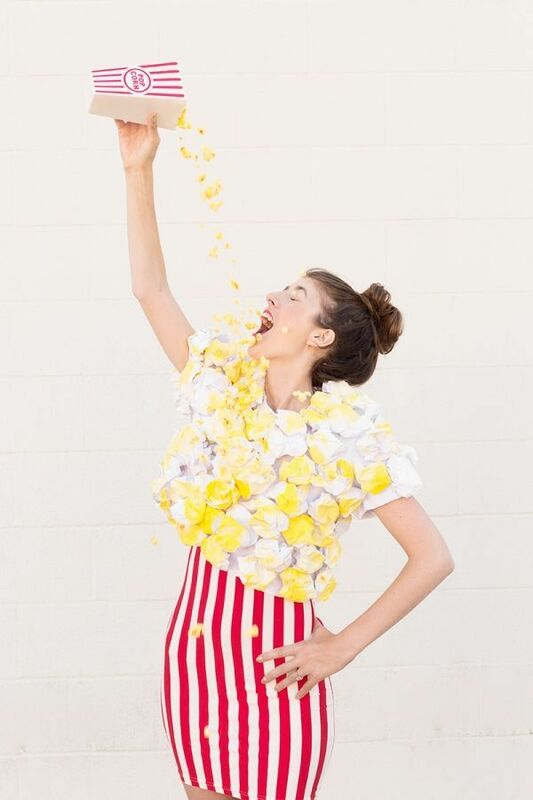 Become your favorite theater snack by wearing stripped bottoms and a white top. To make the popcorn, simply bunch together yellow tissue paper and glue it to the top. Adams Family. This one can be done alone or with a group. Wear all black and don the appropriate hairstyle for the family member that you are portraying and there’s your costume. Deck of cards. All you and a group of friends have to do is pick a card and recreate it on a white t-shirt and you’ll be decked out. Mario and Luigi. Dress up as these childhood icons by wearing overalls and undershirts using their signature colors. Make your own or order their signature initial caps and you’re good to go. Pigs in a Blanket. In a group of two or more wear pig costumes and wrap yourself in a blanket. Mickey and Minnie. Be the iconic duo by wearing black, white and red and top it off with the infamous ears! Despicable Me Minions. Wear overalls with a yellow top underneath with rounded goggles. Brawny Paper Towel Man and paper roll towel. Have your partner don a red and black flannel with jeans. Become the paper towel by recreating the logo on a white top or dress.